One might think that bringing a favorite tasty treat to their friend in the hospital would be a kind gesture. However, their friend may be preparing for a procedure which precludes them from ingesting food. Without being properly informed, the visitor’s kind gesture might generate an uncomfortable scenario. Were the “No Food or Drink” icon prominently displayed at the doorway the visitor would be able to avoid an awkward encounter. Still other situations are even more serious. Various medications or illnesses make other precautions necessary. Medical conditions such as sensitivity to latex or flowers, the need to rest or diminished immunity are critical communications that often don’t happen in medical environments until it is too late. This set of symbols helps hospitals address communication needs at key points of decision. 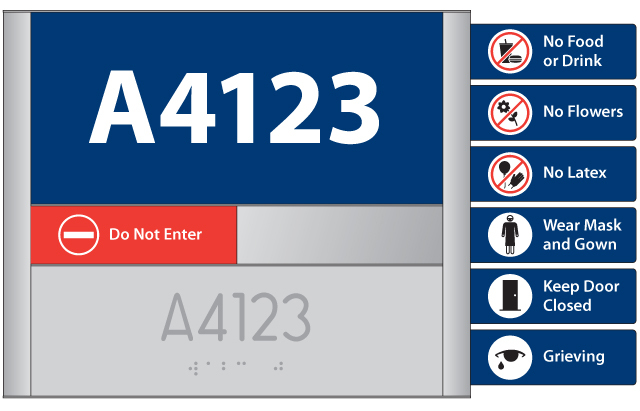 Here is an example of a patient room sign with the symbols on individual message flags which can be displayed or hidden within the sign frame as needed.